Nvidia has just released new GeForce video drivers version 335.23 WHQL that removes the limit of +135 MHz maximum overclock for the GPU that was previously available on all GTX 750 Ti video cards. 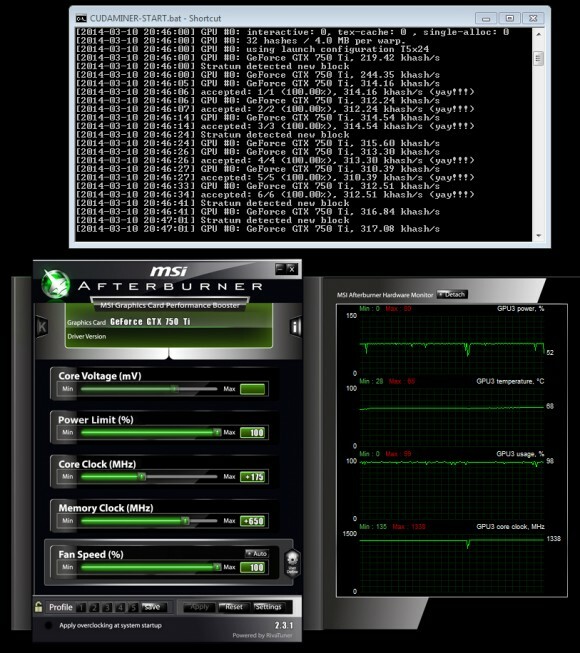 This allows or more serious overclock of the GPU and thus for increased performance in terms of hashrate if your GTX 750 Ti video card is able to handle the extra overclock of the GPU. We have already tried the new driver on our reference design GeForce GTX 750 Ti board and MSI Afterburner now allows us to go to up to +1000 MHz on the GPU unlike being limited to maximum +135 MHz with the older drivers. The maximum we were able to get our card working stable at was +175 MHz on the GPU that has allowed us to squeeze a few more KHS out of the video card. Note that we have the video card flashed with modified BIOS with increased power target limit, if you do not modify the video BIOS even if you set he GPU frequency higher you might not be able to get your hashrate increased due to reaching the power target limit.